The microKORG XL has a streamlined retro interface. 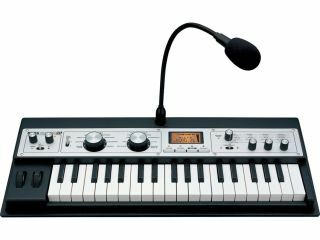 Korg has now confirmed the launch of the microKORG XL, and it's also released spec details of this new mini synth. First up, we should tell you that this isn't a replacement for the standard microKORG - it'll sit alongside the original model in Korg's product range as its 'big brother'. However, despite boasting an enhanced feature set, it actually has fewer controls and is unashamedly retro in appearance. As well as a new look, the XL also has a different feel, and this is thanks to the inclusion of a newly developed 'natural touch' waterfall mini keyboard. This promises to improve playability, and benefits from better proportioned black and white keys. The microKORG XL is powered by Korg's Multi Modeling Technology (MMT) - the same as you'll find in its Radias and R3 synths. Its updated ROM contains PCM data, which means that, as well as being able to produce synthetic sounds, the XL can also emulate keyboard instruments such as electric/acoustic pianos and Clavinets. There are 128 sounds in total, and these are selected with two large dials. The first chooses your musical genre, while the second picks the instrument type. There are three performance knobs for quick editing, and these can be assigned to parameters of your choosing. In-depth tweaking can be carried out in the downloadable editing software, and you can also load up converted MS2000 and microKORG programs. Sounds can be further enhanced with two master effects processors that are derived from Korg's Kaoss series. 17 algorithms come supplied, with the delay effects being syncable to MIDI clock. Also onboard is a 16-band vocoder. Level and pan settings can be adjusted individually for each band, and there are Formant Hold and Formant Shift functions. The inclusion of a gooseneck mic means that you can start using the vocoder right away. We're keen to get our hands on the microKORG XL. It certainly looks the part, and hopefully, it'll deliver in the sound department, too. We don't know how much it's going to cost yet, but Korg has told us that it'll be available in February 2009.